You’ve seen them all over this year’s Tour de France coverage. Lance wears them. Cavendish wears them. Hincapie’s been wearing them since the earliest prototypes. 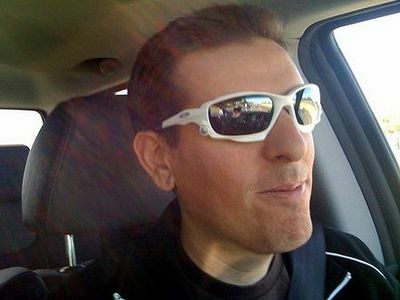 It’s the new Oakley Jawbone, and I just got my own prescription pair this week. I’m still so-so on the looks of them, but behind the lenses and in the saddle, they’re one of the best. I’ve ridden with prescription Oakley sunglasses for the past five years, bouncing from one design to the other, always looking for the perfect combo of features. I want a huge field of vision with nothing obscuring my eyes looking up, down, and, to the sides. I want a design that is comfortable for hours on my head and doesn’t slide around when the sweat starts flying. I need something that works on the brightest, hottest days as well as night rides and cross racing in the dreary dead of winter. The Oakley Jawbones come out nearly perfect in every way. The view I normally ride in frameless Oakley designs since they offer the widest and tallest field of vision, but even with a full frame the Jawbone lenses are huge, offering more lens above the eye than any other sunglasses I’ve ridden. In the drops, body crouched over the bike, I frequently see the top frame of my sunglasses but with the Jawbones, the only thing I see at the top of my vision is my own eyebrows. Peripheral vision is great as well, due to the wrap design. About the only issue I had with these glasses are the bottoms of the frames are slightly wider than most, so looking down at my bike computer required me to tip my head just a bit more than I was used to. These glasses seem to be designed specifically for the road riding position, with the best range of vision happening when your eyes are rolling up a bit into your head while in the aero position. The fit The Jawbones fit my face great and the frames plus lenses are very light in weight. The nose pads are large and the ear pieces are wide, distributing what little weight there is evenly so there are no hotspots. Both the nose pieces and the ear pieces have an almost tacky rubber that sticks in place no matter how much you sweat. My other shades tend to slip and slide after an hour or two of riding but I’ve found the Jawbones to stay put for the entire duration of a ride. Other details The price runs about $250 for normal vision Jawbones with a second set of lenses for night or low light riding (great for cross season and winter training rides) that easily swap in (the whole point of the design is to hide a hinge for lens swapping). The prescription versions add about $200 for custom lenses, and though they can be swapped, you’ll have to pay another $200 for clear prescription lenses to go with your dark ones. The design of course is controversial. I’m not entirely sold on the way they look as they seem a bit too mechwarrior looking and I wished they made the bottom part of the frame thinner (it kicks out like an airfoil at the bottom of the lens, seemingly for show). When you have them on, it doesn’t really matter what they look like on the outside and the performance aspects won me over instantly. Overall, I’m loving these after wearing them on a few hot and sunny rides. They seem like the best cycling eyewear Oakley makes and though they have a design that might take getting used to, I’d argue the giant shields of Oakley Radar Path shades are even goofier looking off the bike. I’m ordering some clear lenses for night rides and the upcoming cross season and look forward to wearing these lightweight versatile shades year round.